Hello! I have a coworker whose granddaughter (~6YO) was just diagnosed with leukemia. I'd like to make a comfort shawl for her daughter, and I was wondering if anyone could make suggestions as to a nice one that's fairly quick to work up? I've looked at Ravelry, but there are just SO MANY that I was hoping for some input from someone whose actually made one. Thanks in advance! Ever had those people that doesn't appreciate what u make? Amish looking? Really??!? Have you SEEN the handmade quilts that they sell in Pennsylvania in the Amish areas? They are BEYOND compare, and worth every penny. Anyway! I've always been really afraid to give crocheted gifts to those I don't know VERY well, for this very reason. Luckily, the worst reaction I've gotten so far was no reaction at all (no thank you card or call for a mailed crocheted baby gift), and when at a craft fair, asking me why they should pay this much for a hat I made when they can get it "at Walmart" for a lot cheaper. I asked her to go buy one and bring it to show me, and I would reimburse her. She never came back. I recently made a star-shaped afghan (Frank ORandle's mini Galaxy of Change) for my 8 year old nephew, and he went BANANAS!! He actually cried when he realized I had MADE it for him with my own hands. Totally worth it. Hi! So, I have a boss who has a milestone coming up. 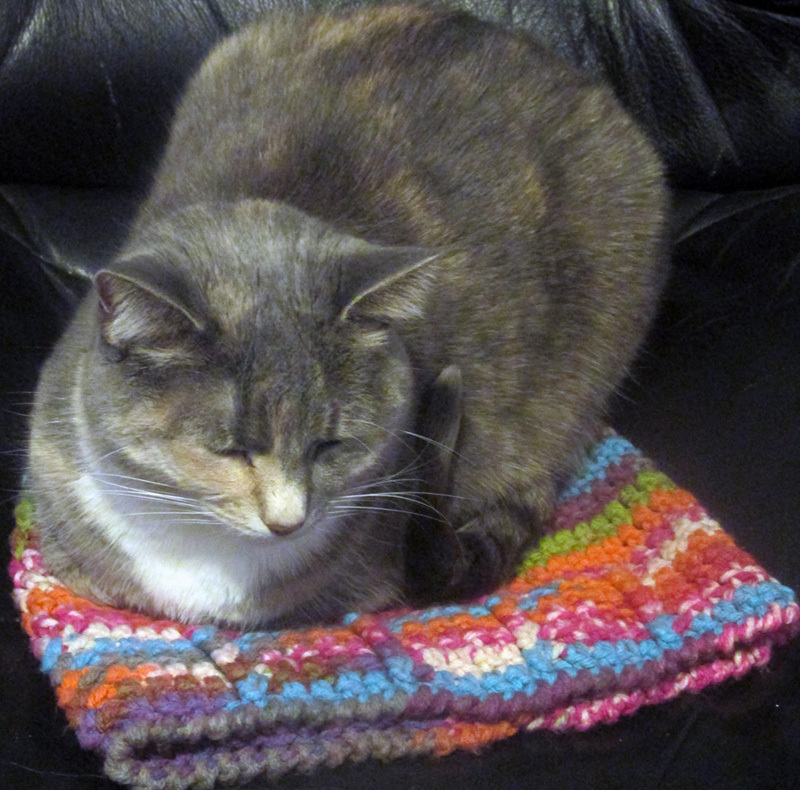 She's a pretty classy lady; she likes a lot of the crochet stuff that I do, but I've only ever made her a pile of washcloths to pair with homemade soap for a Christmas swap (since we had a $$ limit of only $10). I would like to make her a wearable that I can finish with some of the beautiful buttons I picked up a while back, perhaps a sweater or a shrug or something like that. Trouble is, I'm VERRRY impatient, and usually only make small things because of that. I'm wondering if anyone might be able to suggest a wearable that I could do fairly quickly, that would look classy and button-closed...? Message to accompany comfort shawl? We went over to their house, since the husband wasn't at work due to the wife's first chemo session, so I just gave it to her there, and explained what it was (and that it was fully washable and dryable!). She seemed to really like it, even as tired as she was. I hope it gives her some comfort. Thanks to all! I'm going to be laid up for the next 5 days or so, and I thought I might start making hats for the upcoming winter craft fair season. I was planning on making the animal hats that I had such success with last year; is it reasonable for me to expect that they'll be popular again next season? I just don't want to make all kinds of, say, owl hats, only to find out that nobody wants those anymore! Any insight or thoughts are greatly appreciated! I know I've seen it... it's a beanie that's put together to look like the monster is eating the kid's head, with little teeth hanging down. I have a request for a hat that I think calls for that pattern. I tried to find it but haven't had any luck. Anyone know whereabouts it might be?? Thanks! Exactly my thought, RecycleCindy; I plan to make (at least) one of these to add to a tote for my sister =D Thanks so much for sharing the pattern, Rachel! Any chance we could revisit the "Row 10 Issue?" I'm working on this now, and am stumped by it! Row 10: Beg-trCl in first trCl, ch 5, sc in 5th ch of next ch-9 space, picot, ch 5, trCl in next trCl, *picot, trCl in next trCl, ch 5, sc in 5th ch of next ch-9 space, picot, ch 5, trCl in next trCl; repeat from * across, turn—24 clusters. In the bold section there, where it starts the repeat? I have NO idea where THAT particular picot is supposed to go! The way it reads it sounds like you're supposed to put the picot AND the trCl in the same place, but that doesn't make sense, does it?!? Help!! Hello all! I really really want to make this: http://www.garnstudio.com/lang/us/pattern.php?id=2535〈=us but I have to ask (and confess my ignorance); when the pattern says "crochet another front piece, but reverse"... reverse what, exactly? Start from the end of the pattern and work to the front? From the end of each row to the beginning? I just can't really reconcile in my head what is meant by "reverse"! Help!